At this site (and many sites all over the web), we’ve talked a lot about What to Pack in Your Bug Out Bag. Since a BOB is all about survival, we focus on the key areas – like the items which will provide you with shelter, food, water, warmth, and personal security. However, there is no one “best” Bug Out Bag packing list! I’m not saying that you should include all 25 of the items in this BOB list. 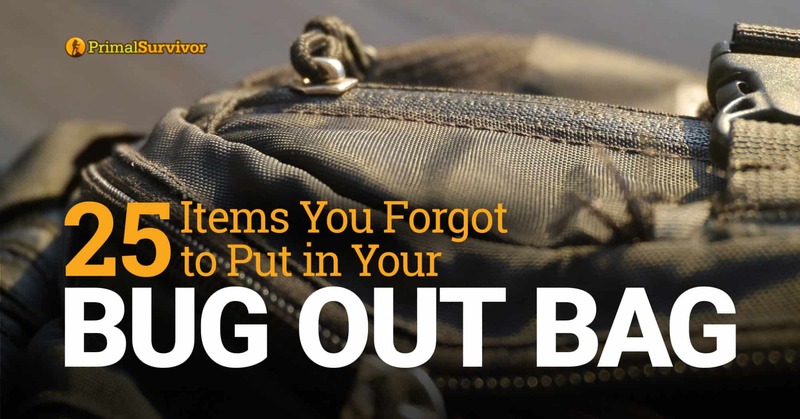 Rather, the purpose of this list is to get you thinking about some of the items you might have forgotten in your Bug Out Bag which are crucial for your unique needs. My wife wears glasses, so this is a must-have for us. We got her some really cool “unbreakable” glasses and keep a spare in her Bug Out Bag. You don’t need that much clothes in your BOB (1 change of clothes should do), but feet are important. Have an extra pair of wool or synthetic socks (they dry faster) to prevent blisters. Having a water filter in your BOB is a good start, but water filters won’t remove viruses. Since you don’t always have time to boil water, make sure you bring some water purification tablets along too. Confused about water purification? Read this article on the 9 Water Purification Methods and what they treat. During disaster survival situations, diarrhea and vomiting are always a top ailment. It happens when people eat contaminated food, drink unpurified water, or just catch a germ due to crowded, unsanitary conditions. Dehydration can kill you! Make sure you have oral rehydration salts in your Bug Out Bag to treat dehydration. If you are interested in how they work, read this article. See if your doctor will prescribe you extra meds so you can keep them in your BOB. Pay attention to their expiration dates and how they need to be stored. Meds will probably go bad quickly if kept in the trunk of your car. In a total SHTF situation, your ID is going to be worthless. But we aren’t just prepping for complete SHTF scenarios. We prep for ALL types of disasters. So make sure you have your personal documents available. Read What to Pack in Your Bug Out Binder here. Remember after Katrina when at least 100,000 people were separated from their families? If you get separated from your family members, you’ll need their photos to help locate them. No backpack is completely waterproof. A rain cover is good for keeping your items dry. But what if you need to quickly cross a river without taking off your pack? This is where an internal dry sack comes in handy. If you aren’t familiar with them, Carryology has a good article on dry bags. There are dozens of reasons to pack trash bags in your BOB. For starters, they can act as a poncho, rain cover, or a ground cover so you don’t have to sit on cold, wet ground. Normally you should never take antibiotics without consulting a doctor. But, in a SHTF situation, you’ll be happy to have antibiotics. Maybe your doctor will prescribe you extra antibiotics to keep handy. Or you can get fish antibiotics. Read this article about Fish Antibiotics for Survival here. When you’ve got a rash on your @ss you’ll be glad you have these. When you are stinky and disgusting and want to clean yourself, again you’ll be glad. As someone who is balding and prone to sunburn in my head, I can attest to how important it is to have a hat or bandana to protect you against the sun. The bandana has more uses than a hat, so it is probably the better choice for most people. A lot of preppers keep a gun in their Bug Out Bag. But I’d say it is also good to have a non-lethal form of self defense too. Pepper spray is a good option because it won’t just protect you from people, but from animals too. Plus, it is silent whereas a gun could give away your location. If you live near nuclear facility, then you will need these Potassium Iodide Tablets to protect yourself from fallout. When bugging out through an urban area, you will likely come across a lot of rubble, broken glass, and burning items. Having rip-proof gloves can give you an edge here. If you want a reason for why having a face mask is so important for your Bug Out Bag, look no further than September 11th. Thousands of people are still dying from the terrorist attack because of diseases like cancer that they got from inhaling toxic particulates which were released into the air. A gas mask is the safest option, but is fairly impractical and quite pricy. For most, a N95 mask is a good option. Read about N95 Masks here. A blister can really slow you down! Have moleskin in your Bug Out Bag first aid kit to treat them. I’m not condoning theft, but in a SHTF situation you will want a lock picking set, axe, pry bar, or other tool to help you get into places. There are tons of lock-picking classes online (like this one). This pocket chainsaw is a great EDC tool which takes up very little space but can be used for cutting through branches, such as if you need to make a shelter. Without an emergency radio, how will you know what is going on in the world? Here’s How to Choose an Emergency Radio. If you will be bugging out by car, pack a siphon so you can get more gasoline. Depending on your location and level of knowledge, you might want a guide on wild edibles, how to make animal traps, or how to make a survival shelter in your Bug Out Bag. From wilderness survival to field guides and reference books – we’ve reviewed them all. Have you ever tried to take a dump in the woods while holding a flashlight? If so, then you know why a headlamp is important! Further, a headlamp means your hands are free and will really help if you need to flee somewhere at night. Mental survival is just as important as physical survival. So go ahead and pack some comfort or entertainment items which will help you stay sane through the disaster. I’ve got a deck of playing cards in my Bug Out Bag. What else would you add to this list of commonly forgotten Bug Out Bag items? Let us know in the comments. My needlepoint; I have small ones and threads to stitch with. Will be getting some more. purchased waxed thread from a fly fishing shop. It increases the tensile strength.